As was noted during the September British Empire & Foreign Countries auction, lots created from the unusual collection formed by Professor Iain Stevenson, lost to us earlier this year, attracted great interest and feisty bidding. A fascinating selection of early to modern Parcel Post material (lot 77) punched its way to £8,680. The sale also featured a first offering from the remarkable Dr. Peter Young collection of Essays, Proofs and Trials, from which came the striking set of six composite die proofs on presentation board (lot 655), submitted by De La Rue for the 1879 Tender for a new 1d. value, that realised £12,400. Another sad recent loss was that of Philip Mackey whose line engraved collection also honoured this auction. 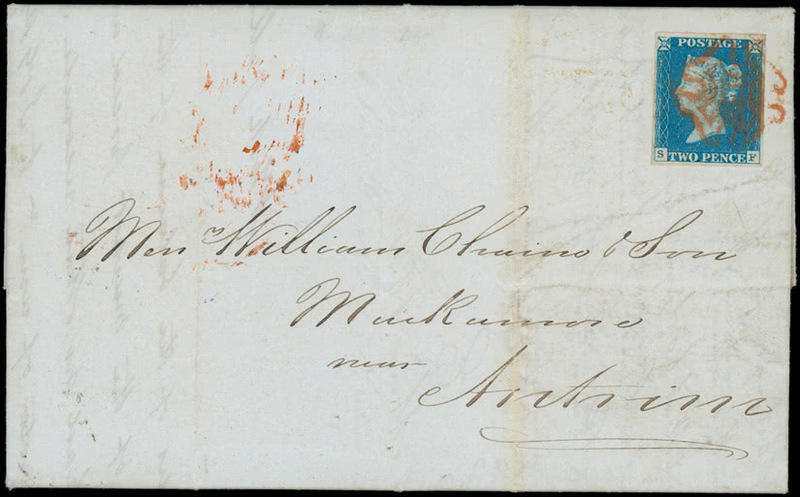 One particularly desirable cover, an 1840 entire addressed to Muckamore, Co. Antrim, written at New York on May 7 and bearing a 2d. 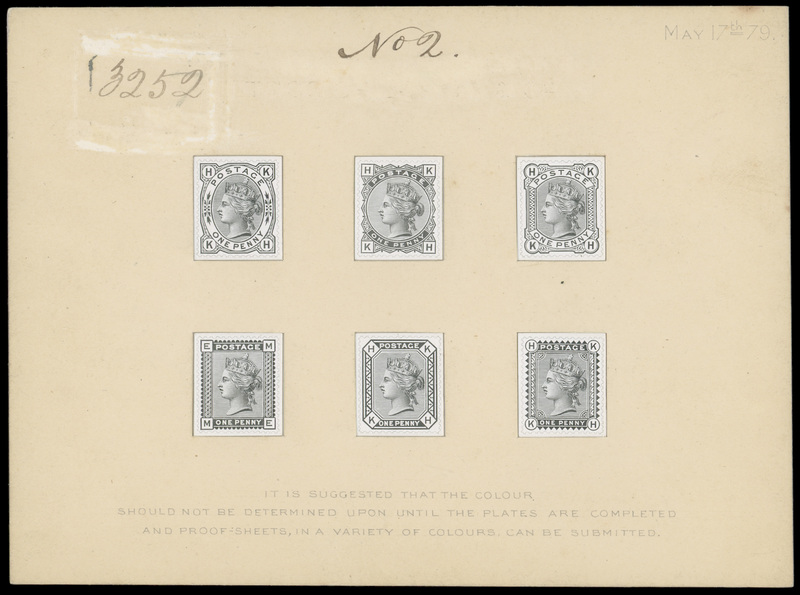 blue affixed and cancelled in Glasgow (lot 975), rose well to £2,604. Plenty of interest was also generated for the Geoff and Joyce Kemp collection of Kent Postal History, the rare step type “SHIP LETTER/SITTINGBOURNE” mark seen on a disinfected 1833 incoming entire from Smyrna (lot 450) achieving £992. 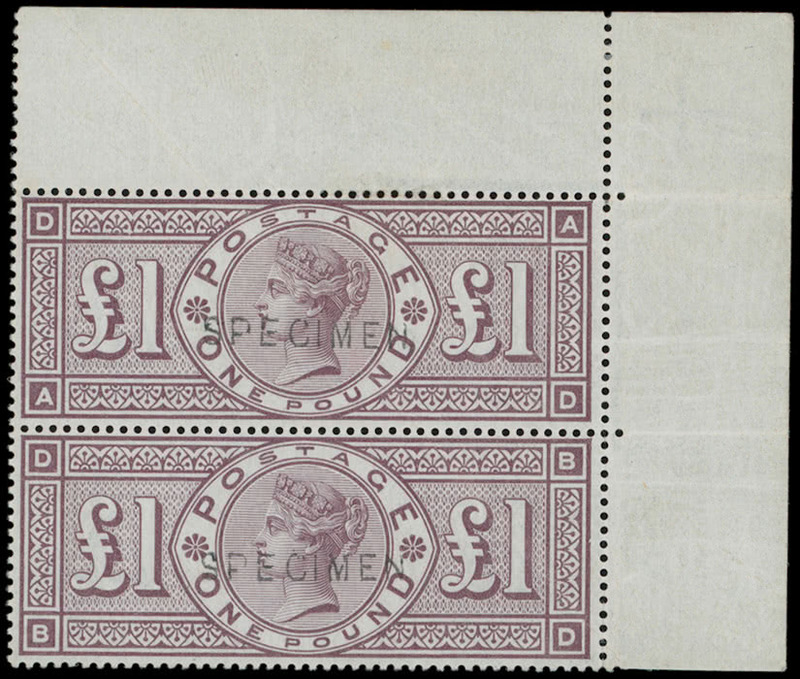 £5,208 for the front cover item, a handsome mint corner pair of the 1888 watermark orbs error £1 brown-lilac overprinted “SPECIMEN” (lot 1477) and, in the later Queen Elizabeth section of the sale, the very rare 1970 British Rural Architecture 5d. 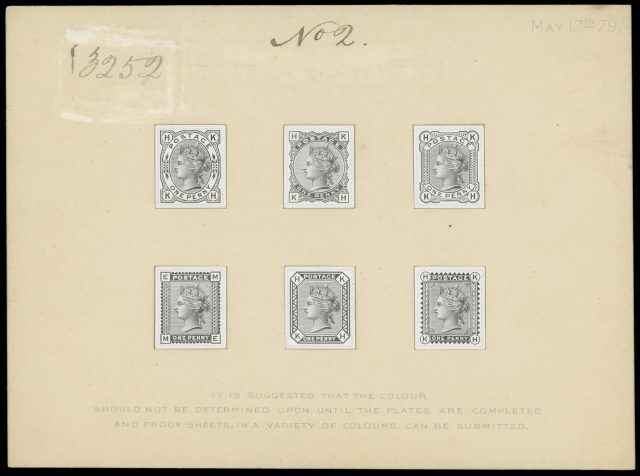 grey (Queen’s head and cottage shading) omitted variety (lot 1897), this being a very fine unmounted mint example despite a tiny indentation in its gum, which climbed to £9,672. It is always pleasing to welcome a new auctioneer into the fold. The closing lots of this auction were placed in the charge of Constanze Dennis who conducted her section in a most confident and competent manner. The stamp market continues in a state of some flux and confused expectation, the future pattern of major auction houses and dealerships yet to be decided. The much touted stamp investment market has become an embarassment. Brexit brings additional uncertainty. None of these changes seem likely, however, to discourage the enthusiastic Great Britain collector from competing against his fellows whenever an exceptionally fine or rare item makes its fleeting appearance under the auctioneer’s hammer.